35%OFFSALE*** MissManeater ONEofaKIND fringed beaded boutique bikini set *** SUPER low rise! 35%OFFSALE*** MissManeater ONEofaKIND fringed + beaded boutique bikini set *** SUPER low rise! This BIKINI TOP style is size SMALL & would best suit a C cup, but for added ooomph you could squeeze D cup in too! 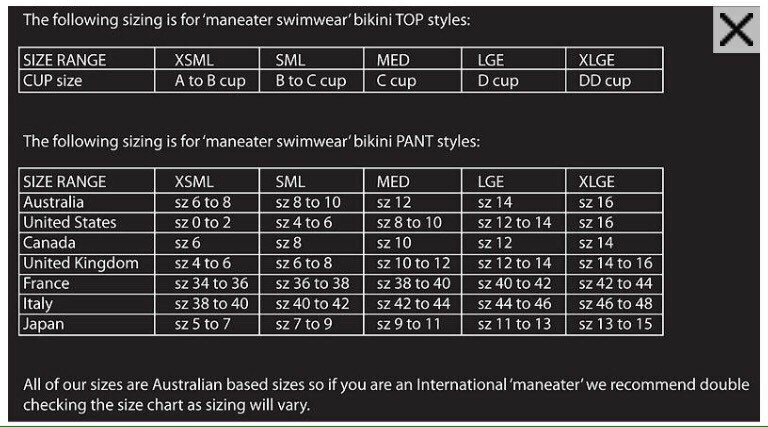 The boutique bikini pant is a size SMALL & as designed as a tie side it all comes down to the height of the pant. With a standard hipster bikini cut to them bum it's all about how you shake your money maker when you strut your stuff! Here at MissManeater we LOVE our SUPER unique #maneaterSTYLE! & the best part is there is & will only EVER be 1 set in the WORLD!!! Whether it be for a photoshoot of you just LOVE to standOUT from the rest! Make sure you are wearing THE best! Choose an original unique MissManeater boutique bikini & you just can't go wrong!